On Bhimrao Ramji Ambedkar's 125th birth anniversary on Tuesday, political parties across the spectrum tried to stake claim on his legacy. Since Independence, governments have introduced schemes to improve the social and economic conditions of Dalits. The current government at the Centre, too, has introduced affirmative action programmes such as Stand Up India, aiming to support entrepreneurship among Scheduled Castes, Scheduled Tribes and women. One example of a successful Dalit entrepreneur is Santosh Kamble, 37, who supplies nylon and leather bags to companies in Mumbai, materials for which he sources from 100-odd small units in Dharavi. Kamble's business is thriving and he plans to open a plant in Bhiwandi. Kamble says government initiatives and an increasing awareness among corporate groups are slowly changing the environment for Dalit businesses like his. "Today, I can proudly say I have about 150 corporate clients," he told Business Standard. His company, Bizcraft, clocked revenue of Rs 6 crore (Rs 60 million) last year and is targeting Rs 20 crore (Rs 200 million), riding on the new Bhiwandi unit. Kamble is confident because of one such government initiative -- a new public procurement policy which mandates that four per cent of the Rs 3 lakh crore (Rs 3 trillion) procured by public sector enterprises annually be sourced from SC/ST enterprises. "This creates an assured market of Rs 12,000 crore (Rs 120 billion) for SC/ST businesses," he said. However, examples like Kamble's are not common. 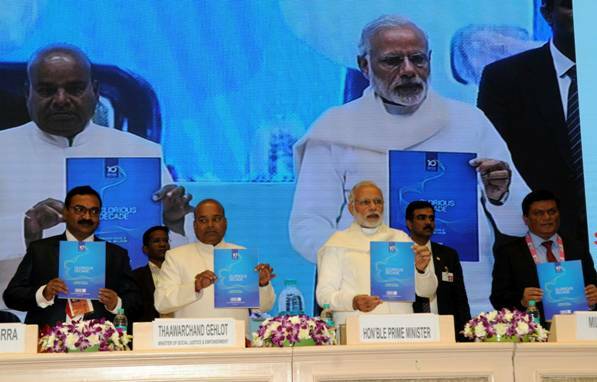 Stand Up India is expected to benefit 125,000 SC/ST entrepreneurs over the next three years. These numbers, though, are pale in comparison to the Dalit population of 300 million, 65 per cent, or about 198.6 million, of whom are believed to be in the age group of 18-35, according to the Dalit Indian Chamber of Commerce & Industry. P S Krishnan, former secretary in the Ministry of Welfare and currently advisor to Government of Telangana, says there has never been a 'systematic study' of SC entrepreneurs. "The general impression is that SC entrepreneurship is growing, but it still is minuscule," he said. Krishnan says SC entrepreneurs continue to face discrimination, particularly those who want get into the business of food. "Moreover, entrepreneurial quality is a result of a network of existing entrepreneurs, which Dalits lack. "Hence, they need much more hand holding. In any case, a vast majority of SCs live in rural areas and are landless agricultural labourers. "So, while the increase in Dalit entrepreneurship is welcome, it isn't a complete solution," he says. Recently, Devesh Kapur, director, Center for the Advanced Study of India, University of Pennsylvania, conducted a survey of the top 1,000 Dalit entrepreneurs in the country. Although the findings are yet to be made public, sources said all 1,000 entrepreneurs, products of the post-reform period, were together worth about Rs 15,000 crore (Rs 150 billion). This is roughly the amount of capital raised by companies in a not-so-great year through initial public offerings, and is just a minuscule fraction of the Rs 96.75 lakh crore (Rs 96.75 trillion) that the 1,300 NSE-listed companies are worth. Even this presents an exaggerated view of the community's economic prospects. Journalist Chandrabhan Prasad, who has co-authored a book Defying the Odds with Kapur, said: "These entrepreneurs do not represent the larger Dalit reality. "But the rise of Dalit enterprise is a new narrative that we must watch." The survey found that most of these entrepreneurs are in the manufacturing sector, supplying parts to Tata Motors, Honda's and Bajaj's motorcycles. The Tata group companies and Pune-based Forge Marshall use services of over 100 welding companies owned by Dalits. Milind Kamble, chairman of Dicci said, there would be about 8.7 million Dalit enterprises in the country. "From 1.5 million in 2001, the number has grown significantly," Kamble added. Dicci's calculation was based on numbers given by Union Finance Minister Arun Jaitley in his previous Budget, where he said there were about 57.7 million micro, small and medium enterprises in the country, of which 62 per cent belonged to SC, ST and OBC entrepreneurs. 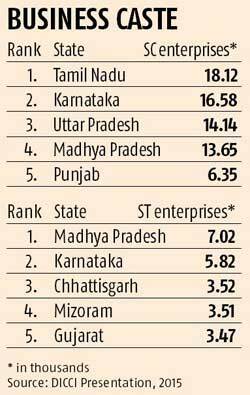 While anecdotal evidence often tends to paint a rosy picture, the share of SC/ST entrepreneurs hovers around 15 per cent, according to Kamble. According to the third All India MSME Census in 2001-02, there were 1.5 million enterprises floated by SC and ST businessmen. This accounted for about 15 per cent of the 10.52 million enterprises that were operational at that time. In the fourth census (2006-07), the number grew to 4.9 million, but their share fell to about 13.6 per cent of 36 million enterprises in the country. Between the third and fourth census, the number of ST businesses grew at a faster pace than SC entrepreneurs. The fifth census is currently being conducted. At a broader level, the economic prospects of the community seem to be improving. A 2013 Columbia University study by Arvind Panagriya and Vishal More on 'Poverty by Social, Religious & Economic Groups in India and its Largest States 1993-94 to 2011-12' said, "The first and foremost point to make is that the level of the SC poverty in 2011-12 has shown a strong tendency to converge toward the poverty rate prevailing across all groups. "At India-wide level, the rural poverty rate for the SC at 31.5 per cent in 2011-12 is now less than six percentage points away from the poverty rate of 25.4 per cent for all groups. "The percentage point gap in 2004-05 was twice of this gap." Late Dalit scholar Rohith Vemula's family on Thursday converted to Buddhism, nearly three months after his suicide led to massive protests. Rohith's mother Radhika and brother Naga Chaitanya Vemula were given 'deeksha' by Buddhist monks in Mumbai in the presence of Prakash Ambedkar, grandson of B R Ambedkar. Prime Minister Narendra Modi on Thursday paid tributes to B R Ambedkar at his birthplace in Mhow cantonment town of Madhya Pradesh. For the first time, the United Nations celebrated the birth anniversary of Ambedkar, describing him as a "global icon" for marginalised people. Telangana Chief Minister K Chandrasekhar Rao on Thursday laid the foundation stone for a 125-feet bronze statue of Ambedkar in Hyderabad. Bahujan Samaj Party chief Mayawati on Thursday sounded the bugle for 2017 Uttar Pradesh assembly election and said any move to weaken the reservation system will not be tolerated. Is Narendra Modi really an OBC?